"When... faith communities begin connecting together, in and for the neighborhood, they learn to depend on God for strength to love, forgive, and show grace like never before... The gospel becomes so much more tangible and compelling when the local church is actually a part of the community, connected to the struggles of the people, and even the land itself." Paul Sparks, Tim Soerens, and Dwight J. Friesen have seen - in cities, suburbs and small towns all over North America - how powerful the gospel can be when it takes root in the context of a place, at the intersection of geography, demography, economy and culture. This is not a new idea - the concept of a parish is as old as Paul's letters to the various communities of the ancient church. But in an age of dislocation and disengagement, the notion of a church that knows its place and gives itself to where it finds itself is like a breath of fresh air, like a sign of new life. 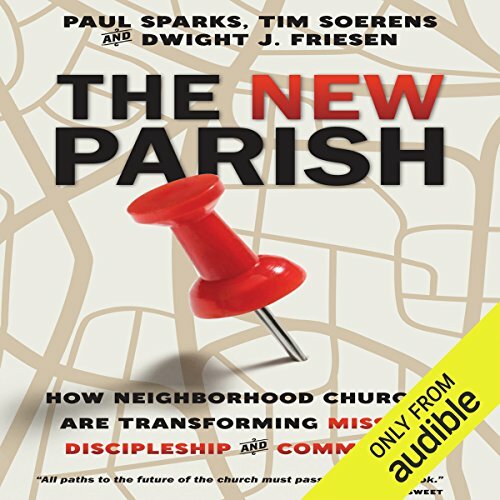 ©2014 Paul Sparks, Tim Soerens, Dwight J. Friesen (P)2014 Audible Inc. Recommend this book even though the big words are sometimes troublesome.I'm inspired to make a difference in my neighborhood. Helped me understand that everything makes a difference but not everything may seem like a big deal. Good content, poor reader's voice. I was able to finish this book, but the tone of the reader was the audible equal to watching paint dry. The only quotes I found myself jotting down were from quoted sources like Lesslie Newbigin and Dietrich Bonhoeffer. It was good to hear people's stories, but a lot of them seemed to be similar to those I've heard in online videos. It's probably a great resource for anyone who hasn't encountered missional communities in person. Just be warned, most, if not all Bible "quotes" are from The Message, so it might offend your sensibilities if you have a liturgical or exegetical background with a high view of Scripture. I much preferred Family on Mission by Mike and Sally Breen. What would have made The New Parish better? Just finished The Longevity Book, Not sure what will be next. I often listen to books while I drive as I drive a lot. this one was hard to listen to that way as it just kind of seemed to go on and on and on.